Depending on the type of your ticket, you may receive them immediately after completing your purchase or as late as the day of the event, which usually happens with tickets that are in high demand. We understand that this could be inconvenient, but we guarantee that your tickets will arrive in time for you to get admitted to the event without a problem. 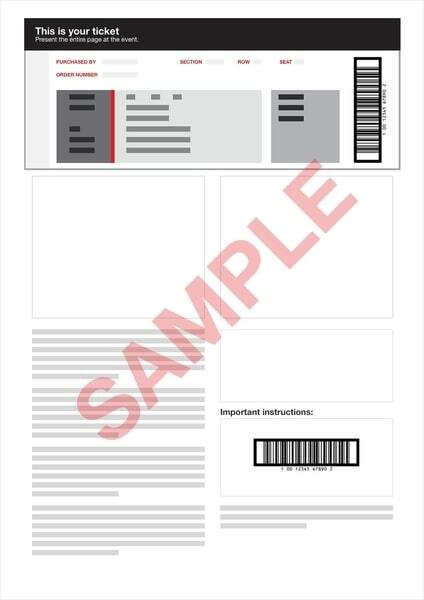 If your tickets look like the example below, you do not have to print them. Simply bring them along on your smartphone. 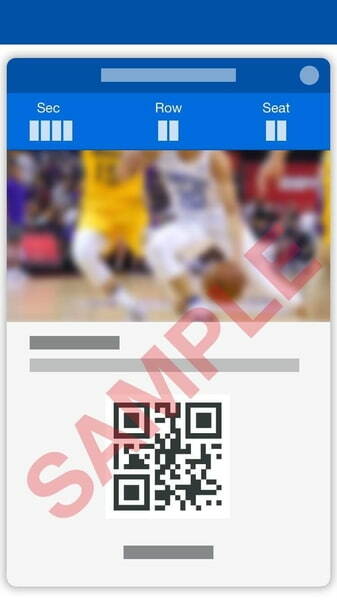 If your tickets look more like the following example, we recommend that you print them. Where can I print my tickets if I am already at my destination? If you have received tickets as a PDF while you are already on the road, don't worry. Usually, the hotel staff can print your tickets for you, but if you would like to print your tickets yourself, all you have to do is find a printing services office near the event venue or the place where you stay. There are dozens of such locations in any city. In any event, if you ever have any problem, do not hesitate to reach out to us, and our representative will help you find the best way to print your tickets. Unfortunately, our tickets cannot be canceled because vendors do not allow cancellations. Still, if there is a problem, please write to us at [email protected], and our representative will review your specific situation. What is the purpose of cancellation insurance, and how does it work? We understand that as you travel, unexpected circumstances may arise at the last moment, preventing you from attending your event. For this reason, we offer optional cancellation insurance. When you get your contract, it guarantees that you would be able to cancel your tickets up to 24 hours prior to the event, no questions asked. Request a cancellation up to the day before the event, and Hellotickets will refund your money. What happens if the event is postponed? If the event is postponed or rescheduled, your tickets will be valid for the new date. If the event is canceled and not rescheduled, you will receive a refund of your entire purchase price. Please contact us if you have questions, and please keep in mind that refunds take between 5 and 7 business days to be processed as they come from international providers. What if I cannot attend the event on the new date? We understand that when you travel, your plans may not accommodate rescheduled events. We always wish to help and strive to minimize the effects schedule changes have on you, so we can issue a refund as long as you can provide justification. What kind of justification can I use? Please provide proof that you will no longer be at your destination or that you already have tickets for another event for the new date and time. This could be an airplane ticket or other event tickets for that day. Please write to our representative at [email protected] and attach your proof. In what format are the tickets sent? You can receive different types of tickets depending on the vendor and the type of event. Please carefully examine the ticket and read the purchase confirmation email to understand what type of tickets you have and whether or not they need to be printed. Sometimes, you will be emailed a simple PDF file, which you will need to print in order to access your event. With mobile phone tickets, you simply need to have them on your smartphone. You will receive an email with a QR code; just download and enjoy! Sometimes, when you complete your purchase, you will receive a code that you can redeem for your tickets at the box office on the day of the event. In this case, it is important that you bring an id that you used to purchase the tickets, so they can be issued to you. The best thing about Hellotickets is that everything is very easy to use, so you don't have to spend a lot of time in front of the screen to get your tickets. Simply search for the date, a city, or a specific event, and pick the price that best suits your budget. We will then ask you a few questions, and you will proceed to check-out, where you will enter your credit card information and see your purchase summary (please examine it carefully to make sure there are no surprises!). When will I receive a confirmation email? As soon as you make your reservation, please check your inbox to make sure you have received an email from us containing your purchase details and instructions on receiving your tickets. That email is proof that everything have worked correctly, so you can rest assured that your purchase is complete. If you still have not received your confirmation email after a few minutes, please check your Junk or Spam email folder. If the message is not there either, please write to us at [email protected], so we can help. We work with a payment platform that guarantees complete safety and security of your payment. Why is the price I see at the check-out different from the one I saw earlier? The initial price that you see on the screen does not include our service fee, which is shown once you proceed to the payment screen. We connect you with dozens of vendors in different countries and work hard to ensure that you have the best experience possible before, during, and after purchase, and all the way to the doors of the venue. This commission is what we receive for our work. We appreciate your putting your trust in us! Why is the price printed on the ticket different from the price I paid? The prices are set by the vendors of the tickets, and Hellotickets is unable to alter prices marked by them. Because of this, depending on the demand for a particular event, a vendor may change what they charge. Until what age are children admitted free? It depends on a particular event. If you have a question, please write directly to [email protected] to learn the details. When you buy tickets during the same transaction, we always ensure that they are together. Why does someone else's name appear on my tickets? Some tickets for sporting events come from holders of season tickets who are unable to attend a certain event and put their tickets up for sale. This is why a subscription holder's name may appear on the tickets. This is completely normal and should not alarm you, as you will not have a problem getting admitted to the event. We are a large group. What should we do to buy our tickets? If you are traveling in a large group, please write to us at [email protected]. We will be happy to help you secure the best tickets.